Gamers are a funny bunch. Board gamers, doubly so. We treasure our board games. We put plastic sleeves on our cards to keep our games immaculate and pristine. We do not tolerate spilled drinks. So writing on the board (in permanent marker! ), placing stickers, and ripping up cards is both incredibly disturbing, and therapeutically cathartic. Yep. That’s a ripped up card. 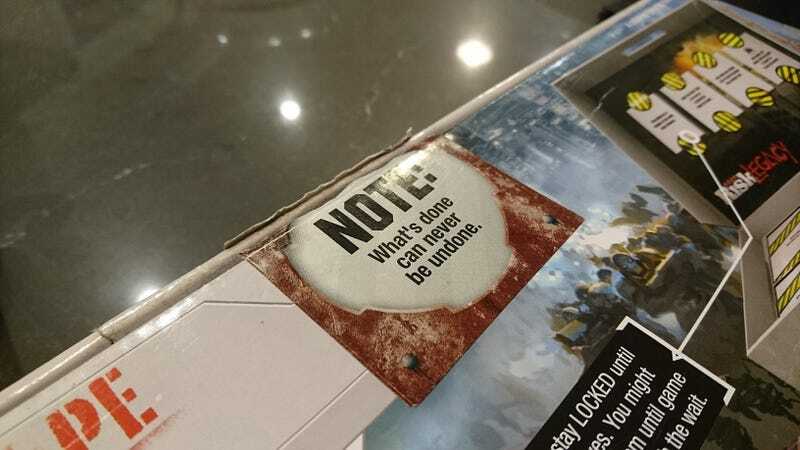 The first ever “legacy” game, Risk Legacy, had this sticker sealing the box: “what is done can never be undone”. It is the most dramatic piece of board-game packaging I’ve encountered, and it proclaims boldly: here is something new. Risk Legacy is the greatest version of Risk you’ve never played, and a high watermark in Hasbro’s extensive catalogue. Designed by Rob Daviau, it is a fusion of avant-garde performance art masquerading as a respectable, mass-market board game (alongside Monopoly, Risk is one of most recognisable board game titles in the world). Nothing like this had ever been done before. Normal board games are like The Simpsons. No matter what craziness ensues in an episode, the next episode starts the same way with the family on the TV couch, and there are never any lasting changes. Bart is trapped in pre-adolescent rebellion, and Homer will never age enough to lose another hair. The central conceit of legacy games is that the game doesn’t reset. Not precisely. Now we’re watching The Wire, or Arrested Development, or Archer, and changes stay changed. Games accumulate history. Games accumulate scars. Like the North, The Game remembers. 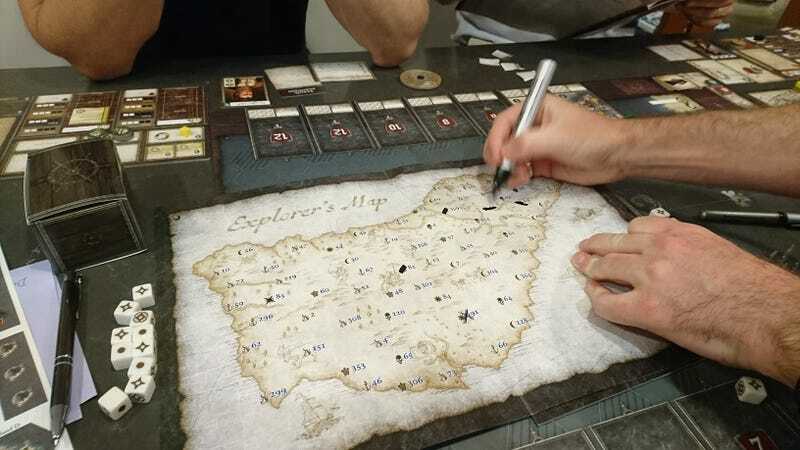 The reality is that Seafall, and legacy games in general, are the beautiful lovechild of board games and Dungeons and Dragons. Playing a board game is now a season-long campaign, and both board and players will have scars aplenty by the end. What is done can never be undone, and the “legacy format” genie can never be put back into the bottle. Pandemic Legacy followed, lodging itself firmly at the top of the BoardGameGeek charts. 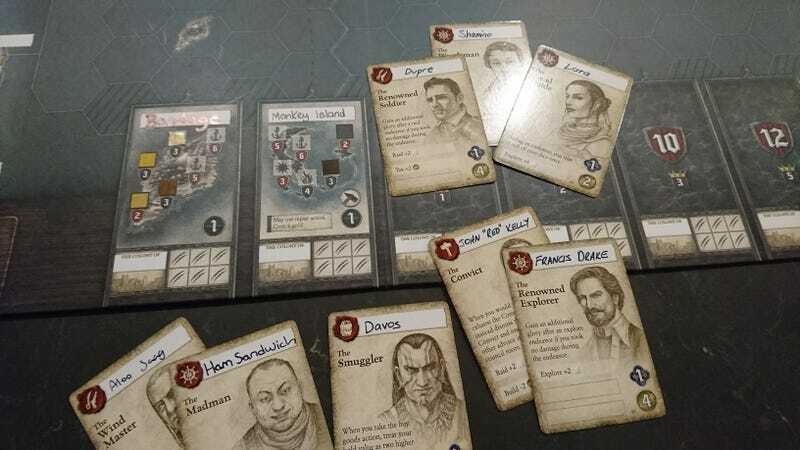 Seafall is the third legacy game, and the first wholly designed by Rob Daviau. Seafall’s a 4X game, channelling the spirit of Civilization or, more appropriately, Sid Meier’s Colonization. We set our soundtrack accordingly, and prepared ourselves to follow the footsteps of Messrs Columbus and Cook, de Gama and Cortez. For there is a sea to be sailed, islands to explore, goods to trade, and natives to mistreat. Doing all of the above gains you glory, and glory wins you the game. Not unlike real life, glory is fickle and fleeting, because glory also resets each game. However in due course, the game will reveal how lasting glory can be gained and kept, and the most glorious player will be ultimately victorious at the end of the campaign. Seafall itself is sumptuous. 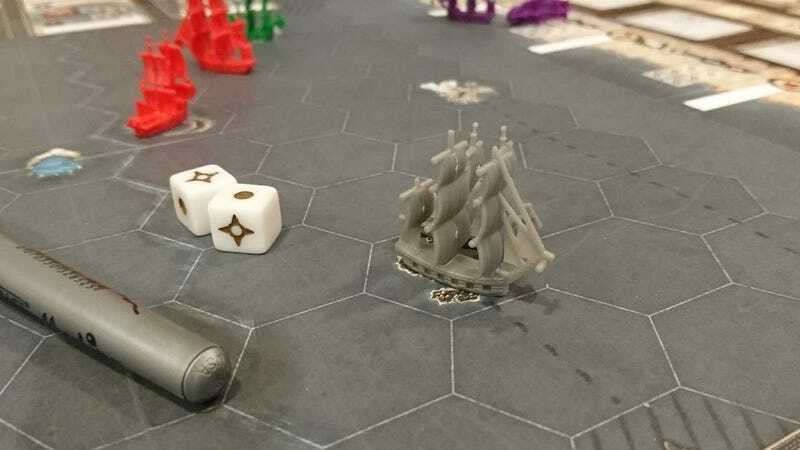 There are miniature ships (one powerful warship, one fast clipper), custom dice, the usual plethora of cardboard, and pre-assembled treasure chests. Each player gets a chest to store their loot, but there are other treasure chests. Sealed ones, and multiple warnings to not open them. Intriguing. The mechanics are complex enough to present multiple strategies (should I play the short term game, raid the island villages, and build lasting enmity, or play a longer, gentler game of trading and building?). Future games promise possession of islands (there’s a place to write my name, but no instruction to just yet), and growing warfare between players. But the first game starts as a gentle race to explore. X marks the spot. Mark it in permanent marker, if you please. Every time a new island was explored, we open the Captain’s Booke. The permanent marker comes out to mark off the areas we’ve explored, and like a Choose Your Own Adventure book, you are presented with an option: steal from the natives or spend time honouring their ways? Let your sailors rest, or encourage them to gather wood quickly? In so doing, we permanently unlock spaces on the board: spice farms, markets and harbours and other intriguing mysteries. 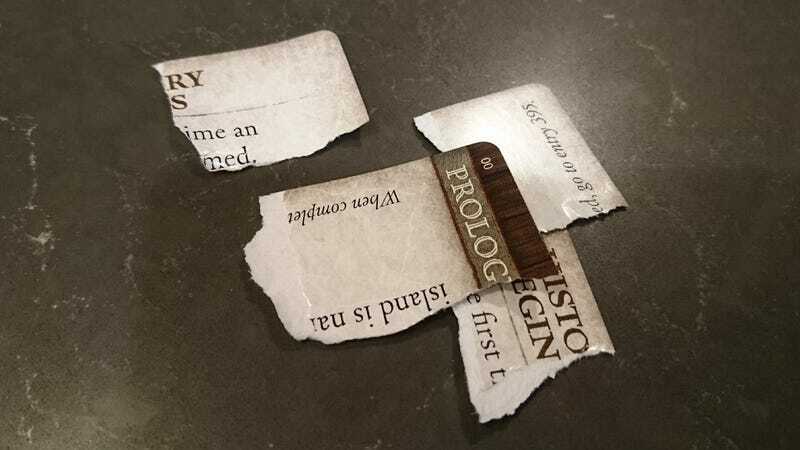 That’s the game — the prologue game, at least. But the real game, the real joy is the name game. You get to name your leader, your port, your province, and your ships. When you hire advisers, they are yours to name. When you reach the target glory points, you get to name an island. Naming things in perpetuity is a daunting prospect. Should your names be whimsical or referential, geeky or mythical or serious? And the glory of our evolving game is that now it is ours. Your copy of Seafall will be different to mine. Only here, with these cards, can Captain Fluffy hire Francis Drake the explorer. Only here can Lara (Croft) guide you to buried treasure, and Dupre (from Ultima) lead your military raids, or risk your lot with that madman, Ham Sandwich. I own a lot of games — a lot of games — but this game is now truly mine. 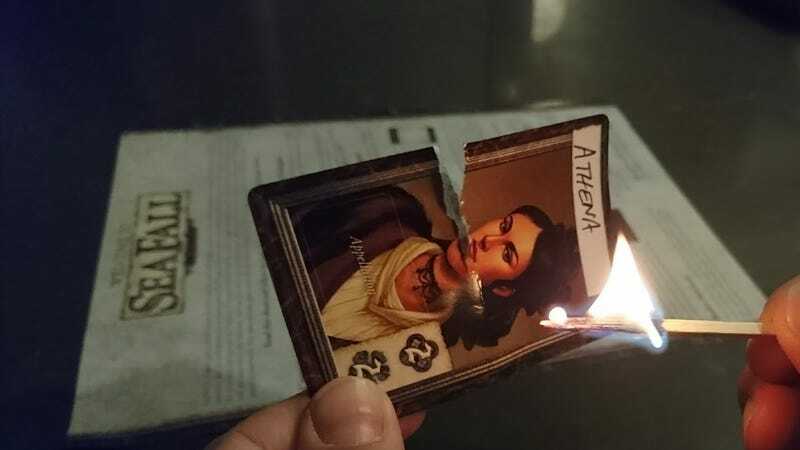 Farewell Athena. You will be remembered. The end of the first game ends up by directing you to rip up cards. Not just any old card, but your character card. My character card, which I’d painstakingly named Athena. But as it turns out, gods can die after all. Other cards had been ripped up in the course if this game, but this one was the hardest. One player flat-out refused to destroy his card, and left it at the bottom of his chest for next week. As you can see, when I tried to tear up the card, I could only get halfway. Actually burning the card was excruciating. Turns out, destroying what you love is hard. I love this game already.